Spaghetti tops are absolutely indispensable during summer. An absolute necessity. Also, it is currently in style. In fact it can be worn in any season. It is just like a camisole but the basic difference is that camisole is worn as an undergarment. Spaghetti tops have thin shoulder straps like spaghetti noodles and now you know where the name has been derives from. The reason why spaghetti tops or spaghetti strap tops are on rise is that it’s very comfortable. It lets your skin breathe during the summer when the skin is prone to sweat and perspiration. 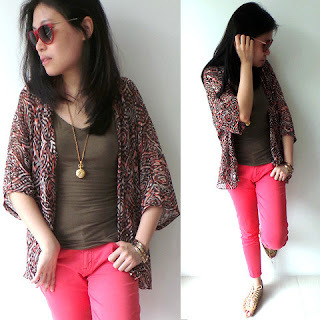 Keep on reading the article for some amazing hacks that will help you wear spaghetti tops yet looking stylish. 1. Floral printed spaghetti tops: Easy breezy with florals. Florals are very much prevalent because who doesn’t like wearing pretty blossom prints? 2. Smocked Spaghetti Tops: Smocked Spaghetti tops complements your curves. It completely fits your body. There’s adjustable straps too, brownie points for that! The ruffles make it look even more pretty! 3. 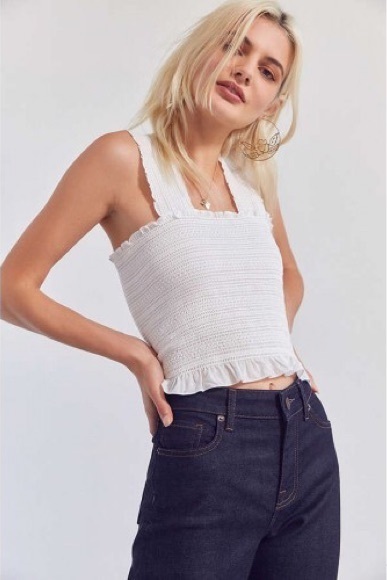 Crochet Spaghetti Top: Made with interlocked yarns and threads, crochet spaghetti tops are certainly going to win your heart. They look very pretty when paired up with blue denim shorts. 4. Black Spaghetti top with striped palazzo: Black never goes wrong. So does stripes. Together they make a killer combination. 5. Printed kimono with spaghetti top and shades: Comfortable kimonos plus spaghetti top plus bright pants plus shades is definitely worth a try. 6. Asymmetrical skirt and white spaghetti top: If you love experimenting and being quirky this one’s worth a shot. You can add a neckpiece to uplift the look even more. 7. Ripped jeans and Spaghetti Strapped Top: The most simple one. Nicole Scherzinger teaches us how to slay in simple outfits. 8. 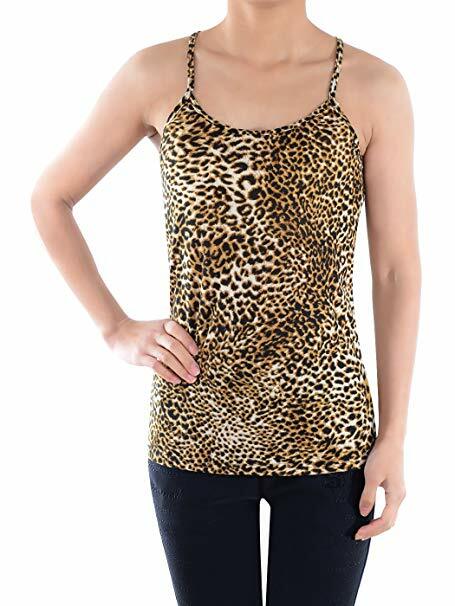 Leopard Print Spaghetti Top: We can never get over the iconic leopard print. It’s flashy and stylish. When style meets comfort you are bound to rock it. Go wild in the leopard print! 9. Off shoulder spaghetti strap tops: Off shoulder top is our bestfriend. Isn’t it, girls? Plenty of spaghetti strap tops inspiration. Which one is your favourite? Do let us know.